Connection with Council of Four Lands. Polish rabbi, code annotator, and philosopher; born at Cracow about 1520; died there May 1, 1572. His father was a rich and prominent Talmudist, and it may be concluded from the terms "ha-ḳaẓin" and "ha-parnes" which his son applies to him (preface to "Meḥir Yayin"), that he was the chief of the community. Isserles studied in his native city, and then under Shalom Shekna, rabbi of Lublin, whose son-in-law he became. Among his fellow pupils were his relative Solomon Luria (MaHaRShaL), and Ḥayyim b. Bezaleel, who later was his opponent. Isserles returned to Cracow about 1550, when he established a large yeshibah and, being a wealthy man, supported his pupils at his own cost. Three years later he was ordained rabbi and was named one of the three dayyanim to form the rabbinate of Cracow, which community had as yet no chief rabbi ("ab bet din"). In 1556, when the plague ravaged Cracow, Isserles went to Szydlowiec, where he wrote his "Meḥir Yayin." While still young Isserles was recognized as an authority in rabbinical matters. As early as 1550 his relative Meïr Katzenellenbogen of Padua, a man of eighty years, had applied to him to use his influence in forbidding the unlawful printing in Poland of the "Mishneh Torah," which was causing Katzenellenbogen heavy loss. Isserles in ten responsa defended the interests of the aged rabbi of Padua. He also corresponded with many other rabbis, among them Joseph Caro, who answered him in a very considerate manner. A close friendship existed between Isserles and his relative Luria, though, as will be seen, they differed later on various matters (Isserles, Responsa, No. 6). In many respects their aims were similar: both aimed at the truth in their decisions, both worked for the furtherance of Talmudic literature, and both ascribed great importance to customs ("minhagim"). In certain other matters, however, there was great opposition between the two friends, especially in their attitude toward philosophy. Luria was the adversary of philosophy; Isserles, its warm defender, declaring openly that the aim of man is to search for the cause and the meaning of things ("Torat ha-'Olah," III., ch. vii.). Isserles accordingly devoted a part of his time to philosophy. When Luria reproached him for having based his decisions on Aristotle's teachings, he replied that he followed Maimonides, and that he studied Greek philosophy only from the "Moreh"; further, that he pursued his philosophical studies on Sabbaths and holy days only, when people generally took walks, and that it was better to occupy oneself with philosophy than to err through Cabala (Isserles, Responsa, No. 7). The fact that Isserles studied the "Moreh" on Sabbaths and holy days—on which days the reading of profane literature was particularly forbidden—shows how much he appreciated philosophy in general and Maimonides in particular. 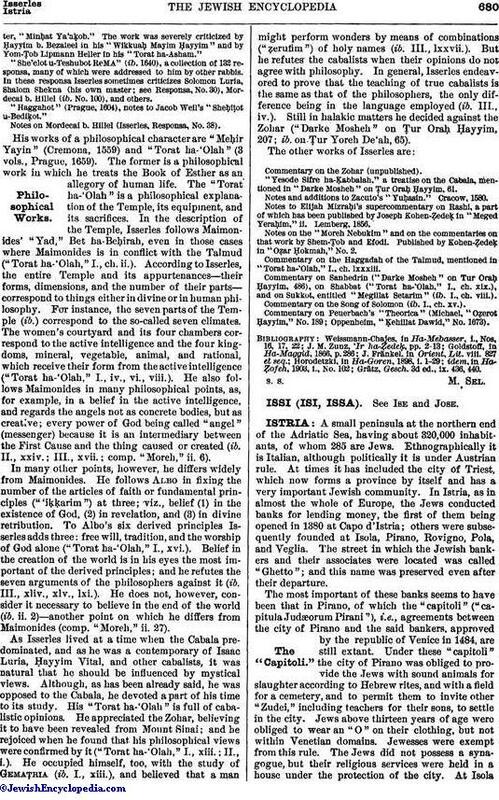 Isserles also occupied himself with the secular sciences; and whereas Caro says that a man must devote all his time to the study of the Torah and the Talmud, Isserles decides that one may now and then occupy himself with the secular sciences provided he is not led into heresy through studying them (Shulḥan 'Aruk, Yoreh De'ah, 246, 4). He himself hadan extensive knowledge of astronomy and a great liking for history. It was Isserles who induced his pupil David Gans to write the historical work "Ẓemaḥ Dawid." Isserles was opposed to "pilpul" (Responsa, No. 78); and he taught his pupils how to interpret the Talmud in a simple way (ib. No. 38). Some of his responsa are written in an elevated style of versified prose, as are his prefaces, though, as he himself declared, he had never studied Hebrew grammar (ib. No. 7). Isserles was also an excellent scribe, and in the scroll of the Pentateuch which he wrote and which is preserved in the synagogue—originally his house, which he gave to the community for a place of worship—there are fourteen readings different from those in other scrolls (see "Ha-Maggid," i. 54, ii. 16). Isserles was prominent in the Council of Four Lands, which was established in his time. 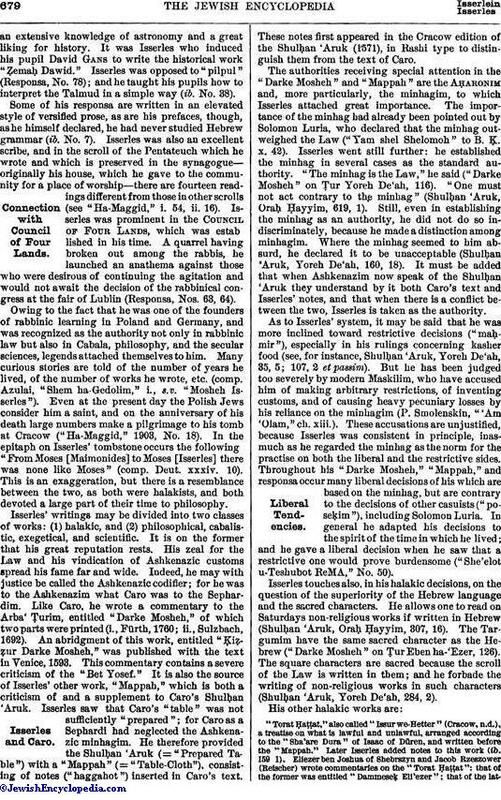 A quarrel having broken out among the rabbis, he launched an anathema against those who were desirous of continuing the agitation and would not await the decision of the rabbinical congress at the fair of Lublin (Responsa, Nos. 63, 64). Owing to the fact that he was one of the founders of rabbinic learning in Poland and Germany, and was recognized as the authority not only in rabbinic law but also in Cabala, philosophy, and the secular sciences, legends attached themselves to him. Many curious stories are told of the number of years he lived, of the number of works he wrote, etc. (comp. Azulai, "Shem ha-Gedolim," i., s.v. "Mosheh Isserles"). Even at the present day the Polish Jews consider him a saint, and on the anniversary of his death large numbers make a pilgrimage to his tomb at Cracow ("Ha-Maggid," 1903, No. 18). In the epitaph on Isserles' tombstone occurs the following: "From Moses [Maimonides] to Moses [Isserles] there was none like Moses" (comp. Deut. xxxiv. 10). This is an exaggeration, but there is a resemblance between the two, as both were halakists, and both devoted a large part of their time to philosophy. Isserles' writings may be divided into two classes of works: (1) halakic, and (2) philosophical, cabalistic, exegetical, and scientific. It is on the former that his great reputation rests. His zeal for the Law and his vindication of Ashkenazic customs spread his fame far and wide. Indeed, he may with justice be called the Ashkenazic codifier; for he was to the Ashkenazim what Caro was to the Sephardim. Like Caro, he wrote a commentary to the Arba' Ṭurim, entitled "Darke Mosheh," of which two parts were printed (i., Fürth, 1760; ii., Sulzbach, 1692). An abridgment of this work, entitled "Ḳiẓẓur Darke Mosheh," was published with the text in Venice, 1593. This commentary contains a severe criticism of the "Bet Yosef." It is also the source of Isserles' other work, "Mappah," which is both a criticism of and a supplement to Caro's Shulḥan 'Aruk. Isserles saw that Caro's "table" was not sufficiently "prepared"; for Caro as a Sephardi had neglected the Ashkenazic minhagim. He therefore provided the Shulḥan 'Aruk (= "Prepared Table") with a "Mappah" (= "Table-Cloth"), consisting of notes ("haggahot") inserted in Caro's text. These notes first appeared in the Cracow edition of the Shulḥan 'Aruk (1571), in Rashi type to distinguish them from the text of Caro. The authorities receiving special attention in the "Darke Mosheh" and "Mappah" are the Aḥaronim and, more particularly, the minhagim, to which Isserles attached great importance. The importance of the minhag had already been pointed out by Solomon Luria, who declared that the minhag outweighed the Law ("Yam shel Shelomoh" to B. Ḳ. x. 42). Isserles went still further: he established the minhag in several cases as the standard authority. "The minhag is the Law," he said ("Darke Mosheh" on Ṭur Yoreh De'ah, 116). "One must not act contrary to the minhag" (Shulḥan 'Aruk, Oraḥ Ḥayyim, 619, 1). Still, even in establishing the minhag as an authority, he did not do so indiscriminately, because he made a distinction among minhagim. Where the minhag seemed to him absurd, he declared it to be unacceptable (Shulḥan 'Aruk, Yoreh De'ah, 160, 18). It must be added that when Ashkenazim now speak of the Shulḥan 'Aruk they understand by it both Caro's text and Isserles' notes, and that when there is a conflict between the two, Isserles is taken as the authority. As to Isserles' system, it may be said that he was more inclined toward restrictive decisions ("maḥmir"), especially in his rulings concerning kasher food (see, for instance, Shulḥan 'Aruk, Yoreh De'ah, 35, 5; 107, 2 et passim). But he has been judged too severely by modern Maskilim, who have accused him of making arbitrary restrictions, of inventing customs, and of causing heavy pecuniary losses by his reliance on the minhagim (P. Smolenskin, "'Am 'Olam," ch. xiii.). 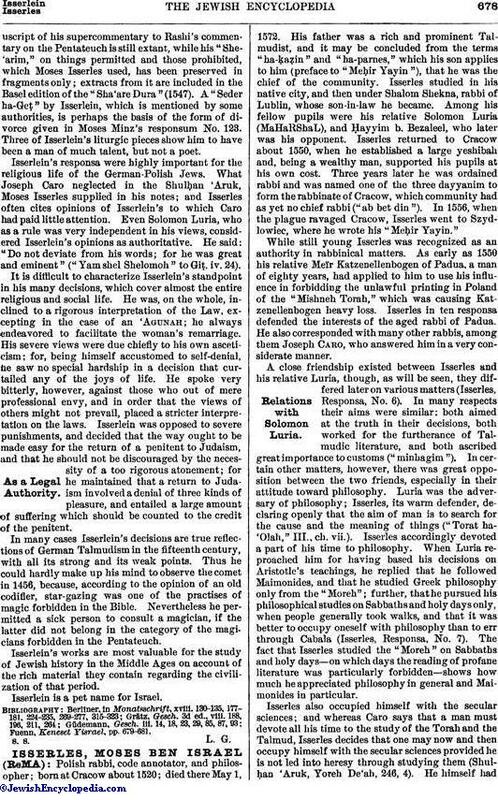 These accusations are unjustified, because Isserles was consistent in principle, inasmuch as he regarded the minhag as the norm for the practise on both the liberal and the restrictive sides. Throughout his "Darke Mosheh," "Mappah," and responsa occur many liberal decisions of his which are based on the minhag, but are contrary to the decisions of other casuists ("poseḳim"), including Solomon Luria. In general he adapted his decisions to the spirit of the time in which he lived; and he gave a liberal decision when he saw that a restrictive one would prove burdensome ("She'elot u-Teshubot ReMA," No. 50). Isserles touches also, in his halakic decisions, on the question of the superiority of the Hebrew language and the sacred characters. He allows one to read on Saturdays non-religious works if written in Hebrew (Shulḥan 'Aruk, Oraḥ Ḥayyim, 307, 16). The Targumim have the same sacred character as the Hebrew ("Darke Mosheh" on Ṭur Eben ha-'Ezer, 126). The square characters are sacred because the scroll of the Law is written in them; and he forbade the writing of non-religious works in such characters (Shulḥan 'Aruk, Yoreh De'ah, 284, 2). "Torat Ḥaṭṭat," also called "Issur we-Hetter" (Cracow, n.d.), a treatise on what is lawful and unlawful, arranged according to the "Sha'are Dura" of Isaac of Düren, and written before the "Mappah." Later Isserles added notes to this work (ib. 159 1). Eliezer ben Joshua of Shebrszyn and Jacob Rzeszower (Reischer) wrote commentaries on the "Torat Ḥaṭṭat": that of the former was entitled "Dammeseḳ Eli'ezer"; that of the latter,"Minḥat Ya'aḳob." The work was severely criticized by Ḥayyim b. Bezaleel in his "Wikkuaḥ Mayim Ḥayyim" and by Yom-Ṭob Lipmann Heller in his "Torat ha-Asham." "She'elot u-Teshubot ReMA" (ib. 1640), a collection of 132 responsa, many of which were addressed to him by other rabbis. In these responsa Isserles sometimes criticizes Solomon Luria, Shalom Shekna (his own master; see Responsa, No. 30), Mordecai b. Hillel (ib. No. 100), and others. "Haggahot" (Prague, 1604), notes to Jacob Weil's "Sheḥiṭot u-Bediḳot." Notes on Mordecai b. Hillel (Isserles, Responsa, No. 38). Commentary on the Zohar (unpublished). "Yesode Sifre ha-Ḳabbalah," a treatise on the Cabala, mentioned in "Darke Mosheh" on Ṭur Oraḥ Ḥayyim, 61. Notes and additions to Zacuto's "Yuḥasin." Cracow, 1580. Notes to Elijah Mizraḥi's supercommentary on Rashi, a part of which has been published by Joseph Kohen-Ẓedeḳ in "Meged Yeraḥim," ii. Lemberg, 1856. Notes on the "Moreh Nebukim" and on the commentaries on that work by Shem-Ṭob and Efodi. Published by Kohen-Ẓedeḳ in "Oẓar Ḥokmah," No. 2. Commentary on the Haggadah of the Talmud, mentioned in "Torat ha-'Olah," I., ch. lxxxiii. Commentary on Sanhedrin ("Darke Mosheh" on Tur Oraḥ Ḥayyim, 486), on Shabbat ("Torat ha-'Olah," I., ch. xix. ), and on Sukkot, entitled "Megillat Setarim" (ib. I., ch. viii.). Commentary on the Song of Solomon (ib. I., ch. xv.). Commentary on Peuerbach's "Theorica" (Michael, "Oẓerot Ḥayyim," No. 189; Oppenheim, "Ḳehillat Dawid," No. 1673). Grätz, Gesch. 3d ed., ix. 436, 440.